I always encourage anyone who is interested in playing poker for real money, to first take a step back, and then try and digest as much information as they possibly can do, for the more you learn about playing poker the better your chances of winning will be. While some players will much prefer playing poker for free to gain valuable playing experience, some players will spend hours upon hours watching other players playing on websites such as YouTube to try and learn from the way their poker playing peers play. However, there is another way you can learn how to play poker much more strategically, and that is by getting any of the following poker books, all of which come personally recommended, and all of which are going to give you a deep insight into lots of different aspects of playing poker games in any poker playing environment too! 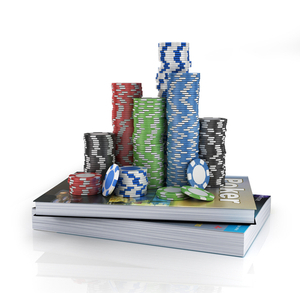 What I would suggest anybody who is very serious about learning more about playing poker is to read as many books above every single aspect of playing, as that way nothing will escape your notice when playing which is of course very important. Therefore one book that I do feel every single poker player should read much sooner rather than later is Essential Poker Math, Expanded Edition which was written by Alton Hardin. As the name of that book does suggest it is going to explain to you and give you a very clear and definitive insight in the math surrounding poker which is a very vital ingredient in knowing how to play off each hand optimally and perfectly too. The Theory of Poker: A Professional Poker Player Teaches You How to Think like One, is another book that you should read, and read from cover to cover to if you are on a quest to improve your poke playing actions. The author of that book is David Sklansky, and I do have to admire and comment on the way that he has written the book for it does explain in terms that even novice players can and will be able to fully understand the thinking behind playing and betting decisions when at the poker table. A Comprehensive Beginners’ Guide to learn and Understand Poker Math in Order to Win the Games of Poker is quite a title for a poker book, but it is one I do suggest you read in your never ending quest for valuable poker related information. The author of that book is Kevin Bailey, and the one aspect of reading that book that will stick in your mind is being able to grasp the truest value from any hand or hands dealt out to you, which is the most important aspect of making any playing and betting decisions! Now it is very true to say that not all poker players do have huge bankrolls, and it is also true to say with the skills needed and required under your belt you could turn a small bankroll into a massive one. Therefore another book you should set about reading sooner rather than later is the Strategies for Beating Small Stakes Poker Cash Games which is a very informative book and one I can recommend it was written by Jonathan Little. What is important when you are on the hunt for any number of poker books to read related to poker, is that you get at least one, but ideally several that are designed and written in such a way they present you with lessons. With that in mind another book that I do feel is going to be very helpful, if the variant you are most interested in is Texas Hold’em is the Phil Gordon’s Little Green Book: Lessons and Teachings in No Limit Texas Hold’em, the author is of course in the title of that book! Dan Harrington is an expert on poker, and he also has something of a passion for writing about it to, and with that in mind you will come across quite a number of books he has authored, and all of them I do say are worth reading. However, you will of course need to start somewhere and an excellent book to read to start your journey into the world of poker tournaments if that is what you are most interested in entering and playing is his Harrington on Hold ’em Expert Strategy for No Limit Tournaments, Vol. 1 book. I would also consider getting some of his if not all of his other books that make up the series of them he has written for they do go into great detail, so you will be digesting a lot of information as you read them, but it will be valuable information by the way! I would suggest that you get the No-Limit Hold ’em For Advanced Players book written by Matthew Janda if you are just learning the ropes so to speak of playing poker, for it is quite a technical book so to speak and one that you are going to have to understand the generals ins and outs of No Limit Hold’em to be able to make sense of it. However, if that is a variant of poker and no limit is the way you enjoy playing it then this book is certainly one that is going to be educating you as you read it and it is a book I can recommend when you feel you want to truly master playing no limits Hold’em Poker and become a much better players too. Doyle Brunson’s Super System 2: A Course in Power Poker is a very popular and much read book, however having read many of his books I do think this one is going to be a good read if you haven’t the time to read any of the many other books he has written on poker. However, having said that I am more than confident that as soon as you do read this book or when reading any other Doyle Brunson authored book you are going to enjoy reading them for he has written each of them form a personal point of view, but he does back up everything he says with could hard facts, which is important. Texas Hold’em for Dummies is probably one book you are going to see in all bookstores in the poker or card game section, and to be fair it is a book that is popular and has sold in very large numbers too. However, the title of the book does indicate that it is only going to be covering the basics of playing poker, but the author, that being Mark Harlan to his credit has done an excellent job of compiling that book and it is a good place to start if you are new to the world of playing poker and it will cover the basics of playing in a very easy to understand way too. If it is no limit Hold’em Poker that you are most interested in playing as opposed to let’s say pot limit Hold’em Poker, then I have just the book for you to read, and that is the Applications of No-Limit Hold’em book that has been excellently written by Matthew Janda. There are many aspects to playing poker of course, however when it comes to no limit games, being as they are such high risks games, you need to have a very well balanced mind and should always know when the best time to fold, call or raise is. That is exactly what is going to be on offer to you within the covers of that book, and he has chosen to write that book in such a way that even if you have only got to grips with the very basics of playing poker, you will still understand what he is saying. There are of course plenty of other books that I have listed and given you an overview of in this poker books guide, and to be fair if you can get hold of each of them the information they are going to be passing onto you really is going to help you become a much better poker player, so do keep that in mind.